In the last 15 years or so, the level of ALL Italian whites has improved dramatically (though in the case of Friuli, the figure might be more like 20 years). This of course includes Verdicchio, as well as the Campanian white triumverate of Fiano, Greco, and Falanghina, Vermentino from both Sardinia and Liguria, Soave, Tuscan Vernaccia, and the list goes on. But back to Verdicchio. Though it is not completely unknown outside the Marche (MAR-keh) region of central Italy, likely a full 99% of it is cutivated there in two appellations: Verdicchio Castello di Jesi and Verdicchio di Matelica. The former zone is lower in altitude, and closer to the sea, and typically turns out fuller, fatter wines. The smaller, higher altitude, and stonier soiled Matelica zone yields higher-toned, more delicate, but more complex wines. Verdicchio – like most Italian white grapes – is a high acid variety. And as we all know (I hope), the right acidity = “freshness” and food-friendliness. But Verdicchio isn’t just a tangy, salivary gland-squriting summer sipper. 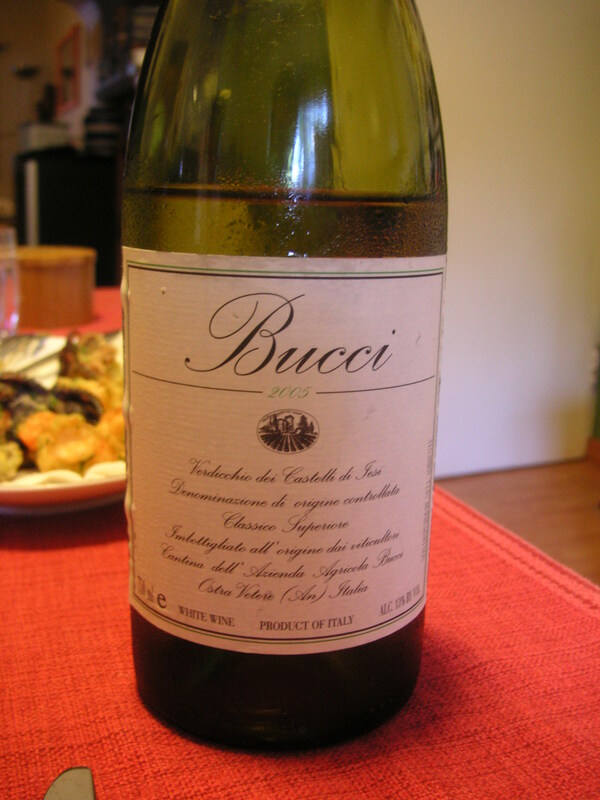 Verdicchio is a moderately to full-bodied and minerally and muscular wine (Verdicchio is sometimes likened to Chablis) typically exhibiting flavors/aromas of pear, apple, citrus, and tropical fruits. And despite all this rampant freshness, Verdicchio is wine also that ages very well (properly stored, certain Verdicchios can live 10 years or beyond). Despite what one would expect, and not for lack of trying by fad-following winemakers in vintages past, Verdicchio does not take well to aging in small, and particularly new oak barrels. 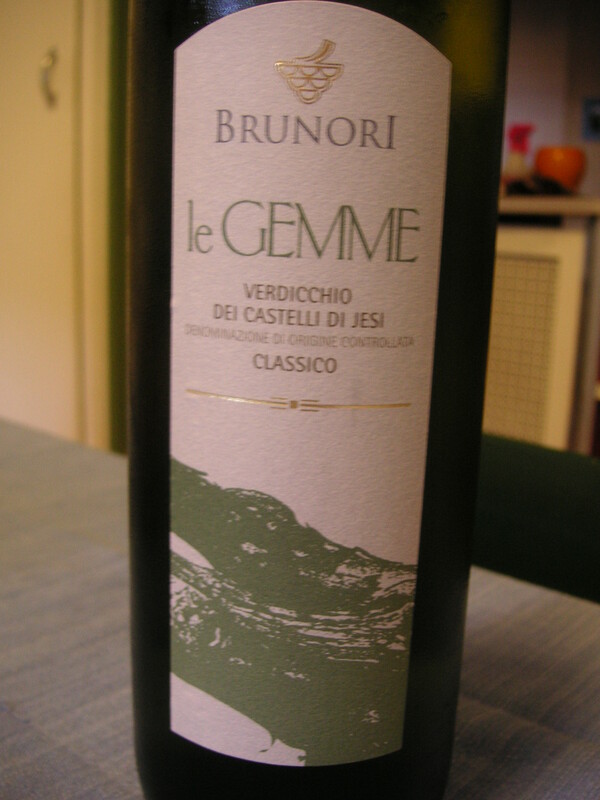 New oak-aged Verdicchio tends to become a fat, butterscotchy almost oxidized product. So having gone to the “other side” and looked into the barrique abyss, most producers now ferment and age in steel tanks and/or in bottle. Quite greenish pale gold color. Floral, almost “aromatic” nose of fresh quince and fennel seed. The palate is a wiry lemon/lime affair with razor-fresh acidity, but with a blancing, underlying heft. Finishes with “shelly” and green apple skin flavors. True golden color with a pervasive greenish cast. Nose of baked apple, honey, yellow fruits, flint, and a touch of sherry “flor”, though the aromas are still a bit shy overall. The palate suggests profundity and complex structure but also still seems a bit tightly wound, but fine lime and pineapple flavors still poke through a very subtle, intricate, “lacy” texture. Still a bit young. Better after 2010. Great to find you back on line after your “Terrior” abdication! Not sure if it is better or worse that I cannot just click on a link to purchase the wines you discuss…..Looking forward to catching up on previous posts. Verdicchio has become a regular part of my line up thanks to a push from you a couple of years ago. Thanks for stopping by! Great to hear that Verdicchio is now in “heavy rotation” for you…it’s a grape that delivers versatile and characterful wine and bottles rarely exceed $20, and most are closer to $10 than $20. Thanks again for posting – Tell your (wino) friends about the blog as well – The more, the merrier!